Simone DeSousa Gallery is pleased to present the third exhibition of the series Cass Corridor: Connecting Times, curated by Nancy Mitchnick, featuring the works of Steve Foust, Greg Murphy, and Nancy Pletos, including paintings, sculptural work, and prints. Nancy Pletos entered Wayne State University as a mathematics major but soon transferred to the art department, where she received her B.A. in 1972. Although a graduate painting major at Wayne (M.F.A. 1974), where she studied with John Egner, Pletos began making small wood sculptures in 1973 (these were exhibited in a two-person show at the Willis Gallery that same year). In 1974, in a one-person exhibition at the Detroit Artists Market called “Oh Memory, Oh Memory, Oh Memory,” she showed several doll-house-like constructions built out of scraps of wood, and filled with furnishings made of bits of fabric, feathers, grass, shells, and mirrors. Pletos’ love of wood was particularly evident in a 1975 series of large, two-dimensional Logs–fantastic, organic shapes carved from sheets of plywood or Masonite. Beginning in 1976, in works she refers to as Furnishings, Pletos playfully embellished ordinary dressers, mirrors, and storage chest by adding various whimsical elements-flower-shaped drawer pulls, dayglo painted rosettes, rhinestones, or wooden beads. It was, however, after her move to New York in 1976, that Pletos, forced to work in smaller studios, created her intimate, hand-sized series, Small Wood Works. In these pieces, carefully assembled from small pieces of wood, colored glass, beads, and mirror fragments, then glazed with thick, glossy pigment or given a gritty texture with sand or sawdust, the artist sensitively transformed ordinary and cast-off materials into magical fantasy sculptures. This series was first exhibited in 1978 at the Feigenson-Rosenstein Gallery and at the N.A.M.E. Gallery in Chicago. Pletos’ wood constructions, the Standing Gardens, exhibited in a 1979 retrospective at the Detroit Institute of Arts, are intricate, vertical spirals, some left unglazed, others lushly and flamboyantly colored. In contrast to the intimate scale of the small wood works, some of the gardens are over five feet tall. Pletos moved to Chicago in 1979, and showed extensively in the Chicago area until she moved back to Michigan in 2004. The pure and rigorous quality of Foust’s art reveals his unique ability to combine formal methods with informal materials (perhaps his ingenious exploitation of everyday materials can be attributed to his years in Africa when, lacking more traditional toys, he was forced to invent playthings out of whatever was at hand). Employing such items as wire screening, duct tape, and sheet aluminum, Foust bases his paintings, fan-like spirals, metal reliefs, and geometric sculptures on complex mathematical and conceptual systems. In 1972, in the first of three one-person shows at the Willis Gallery, he exhibited screen paintings in which he layered two to four painted screens on Masonite to produce constantly shifting patterns of color. Foust employed the same format- flowing patterns created by overlapping color grids-in his 1973 wall painting on the Taj Perfume Company building on Gratiot Avenue. His next group of works (1974) were atypically expressionistic: tension filled, hanging, or wall supported pieces made by twisting wire and small ink stained wooden dowels together with the aid of a vice. Another series o works, shown at the Detroit Institute of Arts in the “Michigan Focus: show (1974/75) and the “works in Progress II” show (1976), as well as the “Cass corridor Artists” exhibition at Somerset Mall (1975), consists of flat, spiraling structures (sometimes rubbed with pale powder) that suggest intricate organic forms. Made from continuous rolls of duct tape that Foist folded, scored and inter-spliced according to a carefully predetermined formula, these pieces vary in size from tiny shell-like shapes to large works (three to four feet in diameter), which can be hung on the wall or placed on the floor. 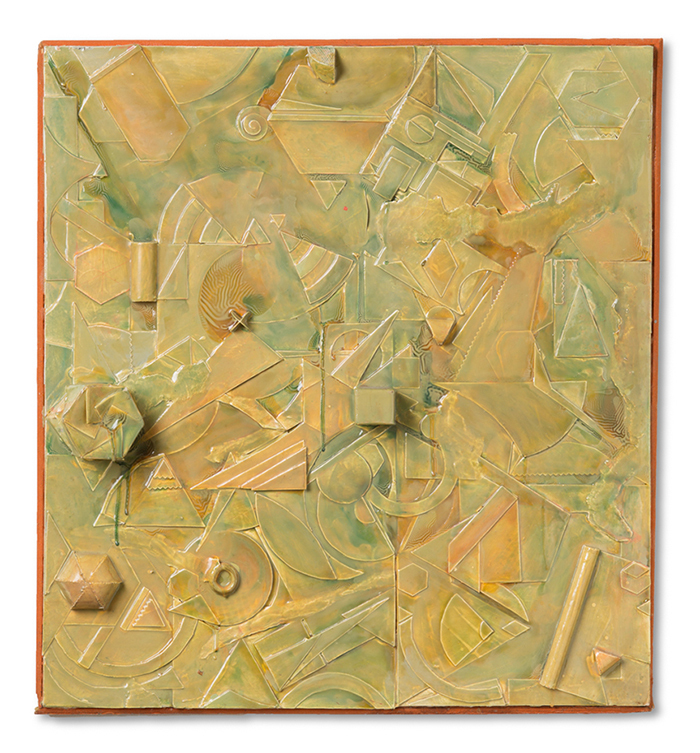 In the “Works in Progress” show Foust also exhibited a sharply angular, painted aluminum floor relief (created in a manner similar to that of the duct tape pieces-cutting and folding the base plate.) Seen from above, this work and others from the series often resemble miniature landscapes. In 1976 Foust moved to New York. His most recent works are fully three-dimensional, free-standing sculptures. Foust currently works and lives in Staten Island, NY. Excerpt of Greg Murphy’s bio, written by Nancy Mitchnick. Greggi was mysterious. He went to U of D, he took classes at Wayne State. But none of us really knows how his life worked before we met him in the late sixties. He was around. He was brilliant and thought about world politics. He was an avid chess player. He planned and schemed. He knew there would be an oil crisis back in 1971, he knew China would be a dominant world player. He explained why, mostly from a bar stool at Cobbs Corner. We thought he was daft and a bizarre fantasist. He drank too much. He could not face an audience. He was a subtle and gifted pianist but when asked to preform, he made the commitment, then disappeared. Greg Murphy was a behind the scenes guy. Greggi had polio as a child and lived in an iron lung for over a year. He walked with a limp. He read voraciously. He had time on his hands. I don’t think that we knew about the syndrome that returned to adults that had polio as children. Greg Murphy was ill and in pain a lot of the time. He didn’t hold steady jobs. Yet somehow he was radiant, hilarious, and inspired. Murphy introduced Sam Wagstaff to the artists and the scene. They talked politics, art history, philosophy, trash, and figured out how to support the gallery. The Cass corridor community came together in bars. John Egner remembers meeting Greg within weeks of arriving in Detroit. I don’t think he ever had a real studio. He hung out. He analyzed. He made interesting work that disappeared. He didn’t leave much of a record.